As a new parent, experiencing sleepless nights and caring for a newborn is no easy task! You may realize that all chores can be done easily – but putting a baby to sleep is the hardest job! 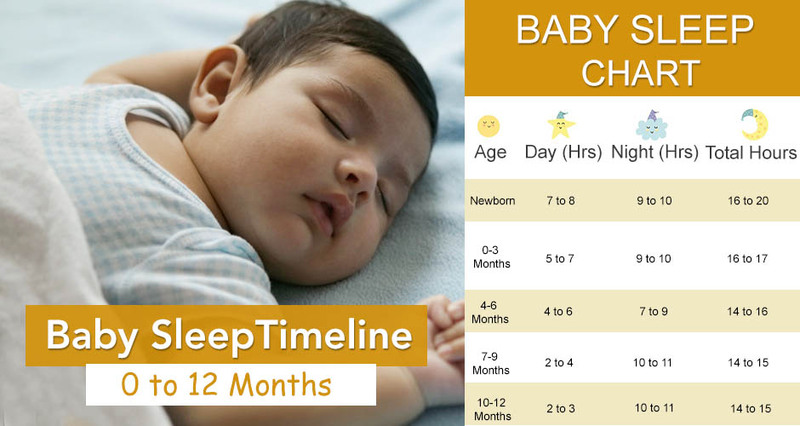 Let’s take a look the at this comprehensive baby sleep timeline for newborns upto 12 months. These are some of the most common queries that new mothers have, with regard to their baby’s sleep patterns. Although each baby is different, there are certain sleep patterns which are common to most babies. Newborn babies need approximately 16-20 hours of sleep per day. Sleep is crucial for the overall development of babies – and especially for their brains. From birth to about 12 weeks, a baby needs a minimum of 5 -7 hours of sleep during the day which can be spread over 6-8 naps. The sleep pattern of newborn babies can be highly erratic but this is nothing to worry about. The baby might be asleep for maximum part of the day and may wake up only for 30 minutes to an hour in between for feeds. In the first three months, infants sleep for a total of 16-17 hours during an entire day – though it may not seem like it! In fact, they wake up only to get a refill of milk or to empty their bowels. At this age, it is very common to see babies smile and chuckle during sleep. This happens because they are unable to control their reflexes. It is really nice to capture a lil one smile while sleeping! Often babies are sleepy but are unable to fall asleep. They don’t know how to go into a deep sleep and get cranky when they are unable to do so. Do not try to keep a tired baby awake. It can make the baby overtired and crankier. Swaddle your baby as it makes babies feel secure. Gentle Rocking can also help the baby get into a deep sleep. Breastfeed your baby to sleep if required. As your baby grows older, the number of naps during the day becomes 4-5. Babies can begin to nap for 3 to 4 hours at a stretch. During this phase they usually sleep for approximately 15 hours in a 24-hour period. Most babies are able to sleep for 7-9 hours at a stretch during the night, making the mother’s life slightly easier. You can also begin fixing their nap schedule by 6 months of age – so that a sleep routine is established. Since your baby is awake for a longer time during the day and is becoming aware of the surroundings, it is a great time to take your child out and stimulate him/her. This is the time to start play activities with your child. It is also a good idea to start morning routine and bedtime activities, which work as cues for little ones. For example, a bedtime story can be a cue that it’s time to go to bed. You can also play some white music each time you put the baby to sleep, so that she falls asleep easily. By now, most babies have 2-3 solid naps during the daytime, that can last for 2-4 hours each. They sleep for about 10-11 hours during the night and their routine is more or less set to a pattern. Since the baby would have started solids, he/she would be able to sleep through the night without feeling hungry. Babies start eating solids by 6 months, so finish the meal time just before their naps – so that they sleep longer. You can slowly consider giving solids for dinner as well, so that baby sleeps on full stomach. Some babies also need comfort nursing to induce sleep. If you see your sleepy-eyed munchkin crying even after being fed and changed, chances are she needs comfort nursing! The awake time is considerably increased at this age. By this time, most babies take just 1-2 naps a day, which last for 2-3 hours and they sleep for about 10-11 hours through the night. Babies become really active during this age and crawl around to explore new things. Physical activity is very important for their development and for them to have a sound sleep. By this age, most babies have learned to roll on their back and sideways. So if your baby is taking a nap, make sure he/she is guarded on all sides. Babies love to practise the new skill they learn, so don’t be surprised if your baby wants to practise walking at night. At night, you must keep a watch on the crib/cot since many babies like to explore and try to climb out of the crib! Some babies, begin to assert their independence and sometimes refuse to go down for a nap – so stay strong mama! 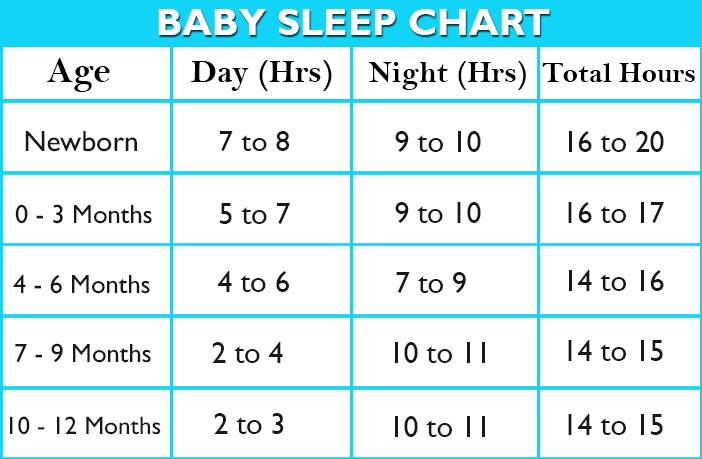 Hope this baby sleep timeline can help you to predict your baby’s sleeping pattern and what to expect sleep-wise during the first year of baby. Although this is true for most babies, a few discrepancies are normal as each baby is different. However, if you find marked differences in your child’s sleep cycle and notice that your baby is not sleeping well or is cranky for no reason – you must consult a paediatrician immediately.